The Man of Steel has served as ambassador of America's idealistic promise to the world. Image courtesy of Flickr. I can’t really remember when I first encountered Superman. It might have been through the 1950s television series The Adventures of Superman, or it might have been in a Superman comic book—not an American comic book, but a black and white reprint, by the Australian publisher K. G. Murray. Growing up in Australia, I learned the basic stories of American history from the pages of these Superman comics. I read about the Boston Tea Party; Nathan Hale’s patriotism; Washington crossing the Delaware (complete with a comic book replication of Emanuel Leutze’s painting); the hoary myth of Betsy Ross, creator of the Stars and Stripes; John Paul Jones’s fighting spirit; and the importance of Lincoln. I knew whose faces are carved on Mount Rushmore. And a Lois Lane story taught me that Hawaii was the 50th state of the union. It might be no surprise that I became a historian of the United States. But Superman’s global impact was not limited to one Australian kid, or indeed, even just to kids. From early in the existence of the character, Superman was seen as symbolic of America, for better or for worse. 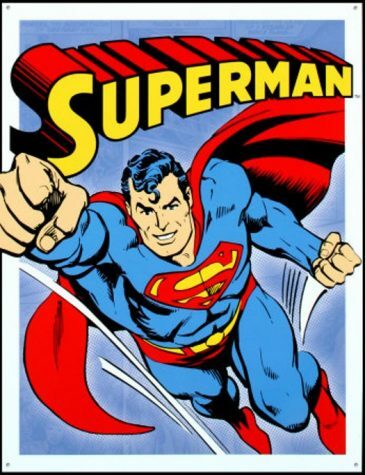 After his debut in Action Comics #1, June 1938, Superman quickly became a global figure, his worldwide fame predicated on his being an American. Who could be more American than Superman, who, though Krypton-born, put his incredible powers to use serving “Truth, Justice, and the American Way”? And what did that mean for the rest of the world? Just how important Superman was to the rest of the world after World War II is hard to evaluate. We know Superman made it as far as Italy, India, and Japan, but there’s little scholarly work that tells us what people in those countries made of him. Anecdotally, it seems that readers around the world loved him—and that cultural critics and politicians worried about the appeal of such a character, and of American culture in general. But he also served as a minor flashpoint for concerns about American power in the aftermath of World War II. In 1949, the Soviet Literary Gazette attacked Superman as promoting the “mass fascisization” of American children. That same year, the French government restricted the type and amount of foreign comics’ content allowed into the country, on the grounds that it created juvenile delinquency. Journalists at Le Monde defended comics and Superman, arguing that it was a bit much to blame the Man of Steel, given the negative impacts of the recent German occupation. His fans applaud Superman’s kindness, decency, and small acts of charity—in contrast to the United States’ attempts at systemic change on a global scale, which sometimes go astray. Image courtesy of Flickr. The most certain evidence of Superman’s global influence, good and bad, comes from the box office revenues of the 1978 Superman movie, starring Christopher Reeve. The U.S. domestic take for the film was $134 million, or 44.7 percent of the total. The remaining 55.3 percent, $166 million, came from the international market. In contrast, the original Star Wars movie of 1977 sold 60 percent of its tickets in the United States and only 40 percent in international markets. Superman was the first blockbuster to derive the majority of its sales in the international market—and it did so nine years before foreign markets regularly became larger revenue generators for American films than the domestic market. Why was it that in 1978, after Watergate and the American war in Vietnam, that an international audience took so eagerly to Superman? Marketing probably had something to do with it. So did the much-publicized hiring of Marlon Brando and Gene Hackman for the film, at great cost to the producers. But—and here lies the tricky bit—the key to the movie’s success was Superman’s role as ambassador of America’s idealistic promise to the world. How can that be, you might ask, when Superman’s fighting for “Truth, Justice and the American Way” seems to many like an oxymoron? The answer lies in Superman’s combination of ideals and independence: He has mostly been an agent quite separate from the American state. To be sure, there were comic book covers and strips during World War II that lent themselves to the war effort, and a late 1960s story set in Vietnam that reflected America’s official views of that war, but very little else Superman did directly represented American foreign policy. The American Way, according to Superman in comics and on screen, was primarily one of simple decency and acts of charity. The movie deliberately tapped into this side of America. In one crucial scene, as she interviews the hero to learn about his origins and purpose, Margot Kidder’s Lois Lane asks Reeve’s Superman why he is on Earth. “To fight for Truth, Justice, and the American Way,” he replies. Lois expresses incredulous cynicism, and Superman affirms his sincerity. At the time, Christopher Reeve told a reporter for The New York Times that it was important for the hero not to be cynical and to believe in the sentiments of that catchphrase. The kindness-and-decency side to Superman is not without its critics. In the early 1960s, the eminent scholar and novelist Umberto Eco, who had about 200 or so Superman comic books available to him in Italy, argued that Superman’s habit of restricting himself to small acts of charity represented a particular ideology that was opposed to necessary systemic change. After all, he said, a hero with the powers of Superman could upend the economic and political systems that lay at the crux of society’s problems and so end the need for such charity. Eco’s Superman functions as a metaphor for American power, though a problematic one. Small acts of charity might have been more appealing for international audiences than the sorts of systemic change America has attempted on a global scale, which have not always gone as planned. Today, as an Asia-based cultural historian who studies the United States, I sometimes wonder what it is that people across the globe still see in Superman. In June of this year I was in Milan’s Chinatown and spotted a painted portrait of Superman, very much in the Christopher Reeve mode, in a shop window. What do the artist or the shop owner have in common with the man I saw wearing a Superman symbol T-shirt yesterday at lunch in São Paulo, Brazil? And what do they have in common with the Malay family of four, all wearing identical Superman symbol T-shirts, who I saw in The Pavilion mall in Kuala Lumpur, Malaysia several years ago? In my research on Superman, I found that for many readers around the world Superman exemplifies how values like tolerance and civility may be used constructively—to promote justice—in places where rulers shut down legitimate debate. Superman offers some hope that whatever you think of America, some of the values it exports may be worthwhile. Loving Superman, just maybe, is one way our world hopes against hope. Ian Gordon teaches American Studies and History at the National University of Singapore, where he heads the Department of History. His latest books are Superman: The Persistence of an American Icon (Rutgers) and The Comics of Charles Schulz: The Good Grief of Modern Life (Mississippi).